Dear Readers, I thank you! In borrowing a little from Charlotte Bronte, I wanted to express my amazement and gratitude that my blog has now had over 10,000 hits. This counts as fame in my book, and yet I can still walk the streets without being beleaguered for an autograph! I have been reliably informed that my musings have influenced reading lists and present purchases. This is incredible, and I get really very excited when I discover a new reader. The little map on my statistics page also suggests that I have readers in every continent except Antartica: if that is to be believed then the penguins are seriously missing out! However, I do find myself home alone for a whole week. Hubby is hobnobbing in various hotels and family stop-off points before heading into a long weekend jolly with friends from Church, Child 1 is revising for finals in Sheffield and Child 2 is enjoying a term without exams in Oxford, (he's done them already...don't worry, the bastion of learning has not given up on examining their students!) The upshot of all this abandonment is bound to be an increase in reading time. My aim is to complete The Miniaturist which I am currently enjoying and then I might treat myself to the new Maggie O'Farrell. I've had it for a couple of weeks and it is still in its postal packaging. Delayed gratification! But this is a book that is easy to read. I purposely chose it after the dense and evocative Gardens of the Evening Mist as I wanted a quicker, light-touch book. This certainly achieved that aim. The protagonist, Jenny Pepper is a middle-aged wife, mother and charity bookshop manager. The book opens with the provocative statement, "Before I was a superhero...I'd have been tidying up." And there you have the plot in a nutshell. She is an ordinary woman, feeling her age, feeling hemmed-in by her life, and significantly, being defined by what she is to everyone else. In many ways it is a familiar story of middle age. The kids are growing up, the career has dwindled as family life has superceded ambition and we wonder how we got here, and more importantly, how are we going to get out! This is not about me by the way! Nor is it about Shelley Harris she assures us in the author interview at the back of the book, but she does say that she relates to the feeling of dreams squandered and having to find the resources to cope when life stares back at you with no interest in who you are anymore. I read an article in the Times Sunday Supplement whilst clearing out the newspapers collected by an elderly friend of mine, and there was a humorous column on the joys of middle age...in this she declared that past a certain point, you realise that you become invisible, indistinguishable, unremarkable. But middle age is not that depressing! Shelley Harris acknowledges this in her plot. Jenny Pepper, whilst walking to a fancy dress evening dressed as a superhero, complete with high heels, cape and a mask, serendipitously comes across an actual crime taking place. Staying in character, she swoops on the scene and protects the victim. Comedic, yes. Plausible? Almost. It is certainly within the realms of suspension of disbelief. But she becomes entranced by the possibilities afforded to her by the anonymity of the costume. It releases her from being just Jenny and empowers her to be somebody different, somebody who effects things around her. for increasingly sinister crime. Undeterred by potential danger, Jenny goes out at night in full costume, patrolling the streets and becoming embroiled in an unbelievable number of skirmishes. This was the point where I did begin to lose faith in my ability to hold onto the storyline and stay with the character. I couldn't find a place to suspend my disbelief long enough to accept that she would have continued to go out, knowingly putting herself in danger and believing herself to be more useful than the police. But I was impressed with the shift to a pseudo detective genre as the novel progressed. I wanted to find out if my hunch on whodunnit was right, and whether I had correctly identified the red herring. It was satisfying to come to the end and feel smug about my own detective skills, but at this point I must reassure you that not once did I leave the house dressed as wonderwoman! I loved being taught by Shelley. She is fun and talented and her classes are both inspiring and down-to-earth. This is a good light read, but it is not my favourite genre. 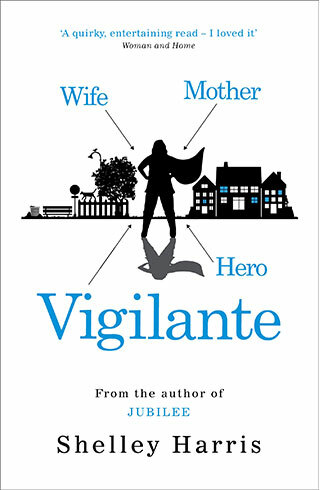 It is quirky, and I laughed out loud at the Conversation with Shelley Harris section when she quotes, "Certainly, when I walked down the streets of High Wycombe dressed as a superhero, I found that I was horribly nervous right up to the point that I put on the mask. Once I was wearing it, I felt in control..."
Anyone who is prepared to research their central character with such passion deserves a wide readership! So...going on a plane, sitting on a beach, or just feeling a bit uninspired by daily life, then escape to a life of vigilante crime-solving with Jenny Pepper. She is no Emmilene Pankhurst, but she does her bit for standing up for the girls!